The French colonial faÃ§ade of ochre washed walls and timber shutters creates a rustic charm. Meandering pathways wind past pools, spas and sauna area all of which are framed by beautiful gardens and shaded by palm trees. 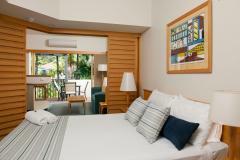 The resort combines hospitality and comfort, which is perfectly matched to the mood of the tropics. Please note this is a non smoking proeperty. Features self contained 1 and 2 Bedroom Apartments which surround a central lagoon style pool. The apartments have kitchenette facilities and laundry facilities. Most apartments feature a spa and some overlook the pool, while the others overlook Hastings Street.